China Southern Airlines is Asia's largest airline group with a fleet that in 2014 exceeded 600 for the first time. Yet just five passenger aircraft – albeit the world's largest – have caused a considerable burden. Financially China Southern's five A380s remain under-utilised with a 12 hour utilisation rate in a brief peak season and eight hours for the rest of the year. 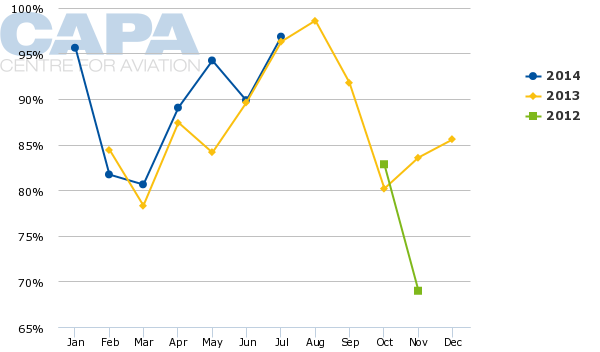 Maintenance costs are increasing and residual values decreasing as the aircraft clock up short-haul sectors. From a marketing perspective, China Southern's flagship boasts only one year-round international service, to Los Angeles, and a seasonal Sydney service. The fleet may get a boost if China Southern follows through with consideration about introducing a daily A380 service on its Guangzhou-New York JFK route, inaugurated in Aug-2014 with four weekly 777-300ER flights. Alternatively China Southern could grow in New York with 10 weekly 777-300ER flights. Large growth would continue the interest Chinese carriers have placed in the US east coast but would add to over-capacity (and losses) in the China-US market. Meanwhile, less than an hour away from Guangzhou, Cathay Pacific has five daily flights from Hong Kong to the New York area. China Southern commenced service to New York JFK in Aug-2014 with four weekly 777-300ER flights. This was China Southern's second US destination (after Los Angeles) and management described it as the last piece in its long-haul network for the time being. But it also noted future long-haul routes could be opened if subsidised (as occurred with late-2014 service to Frankfurt and San Francisco, China Southern's third US destination). Peers Air China and China Eastern have had a presence in the east coast for longer. They were advantaged by hubs - Beijing and Shanghai - with stronger point-to-point traffic as well as better connections within the Chinese market; China Southern's Guangzhou hub at the southern tip of the country means most connections from North America involve backtracking. Guangzhou's added distance also limits what aircraft can be used. China Southern chairman Si Xianmin said during the New York JFK inaugural, as reported by The Street, "For a decade we've been analysing the viability of launching new routes to New York…[but] before we took a 777-300ER we did not have the right aircraft to serve New York routes. China Southern purchased the aircraft for this new service." 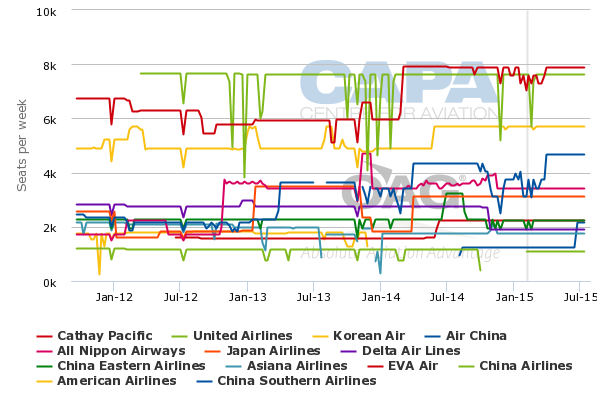 China Southern has five 777-300ERs in service with five more on order, according to CAPA's Fleet Database. The first arrived in early 2014. Firm orders include those placed directly by the operator and by lessors assigned to the operator, from 2-Feb-2015 onwards. Guangzhou-based China Southern has a base in Beijing and earlier tried to launch Beijing-New York JFK service but did not receive CAAC approval, according to Port Authority of New York and New Jersey manager of industry and regulatory relations Bradley Rubinstein, as quoted by The Street. The CAAC generally restricts long-haul routes to one Chinese carrier and Beijing-New York was already served by Air China – the country's flagship. China Southern intended to use A380s on the Beijing-New York JFK route, just as it wanted to do on Beijing-Paris, which the CAAC also did not approve since Air China flies that route too. Hainan Airlines, based in Beijing, had been trying to serve New York too and finally received approval for Beijing-New York service but on the condition it opened a service to Africa (which would surely be loss making). Hainan's New York route has not materialised. China Southern is the only carrier linking Guangzhou with North America although nearby Hong Kong has many links, mostly from local carrier Cathay Pacific. Mr Si said China Southern could not serve Guangzhou-New York JFK with the A380 so it is curious the airline is now considering the possibility. Emirates' services from Dubai to Los Angeles and San Francisco on the A380 are longer than Guangzhou-New York JFK, although Emirates carries little if any cargo (if that was a factor in China Southern's evaluation). Emirates' A380 typically seats 489 compared to China Southern's single configuration of 506. China Southern's current four-weekly flights total 1,236 one-way seats across the week. Going to 10 weekly flights would see a weekly offering of 3,090 seats while a daily A380 would bring 3,542 seats (although there could be operational constraints limiting some seat sales). This would make China Southern the fifth largest between Asia and New York. China Southern would have more capacity into the New York area than ANA or JAL but less than Cathay, United, Korean Air and Air China. China Southern's A380 has three classes (first, business and economy) with first/business seats accounting for 15% of the total while the 777-300ER has four classes (includes premium economy) with first/business seats accounting for a slightly lower 12% share. But this lower share could be more appropriate as China Southern is still building sustainable premium yields. Depending on how costs are calculated, the A380 could be a "cheap" deployment on the New York route since China Southern is already paying for the under-utilised aircraft. Between Dec-2014 and Mar-2015, China Southern's A380 fleet flies a daily return service to each of Los Angeles and Sydney from Guangzhou and two daily returns between Guangzhou and Beijing. This gives an average A380 aircraft utilisation of about 12 block hours a day, although most of these services are loss-making and the short sectors add to maintenance costs. China Southern once quoted the A380's losses in 1H2012 as under RMB100 million (USD15.85 million) but it is likely that figure has increased (depending how the accounting is done). 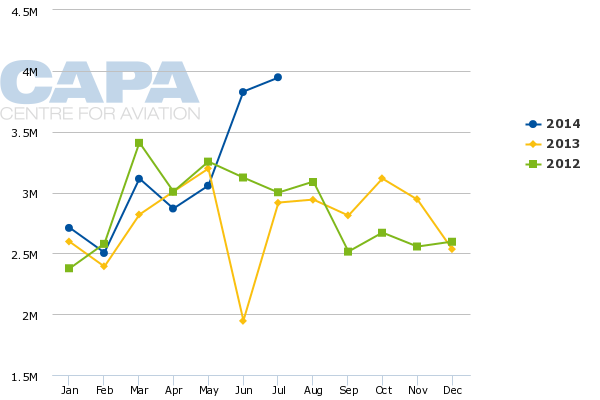 Without the Sydney service, the average utilisation drops to eight block hours a day per aircraft. There is a case for the 777-300ER. 10 weekly 777-300ER flights would give China Southern a boost in frequency. In the peak 2015 season, Air China plans to have double daily Beijing-New York JFK (747-8 and 777-300ER), while China Eastern will be daily but hoping eventually to move to double daily. Cathay Pacific has five daily flights (three non-stop to JFK, one to JFK via Vancouver, and one non-stop to Newark). United has a daily non-stop flight from Newark to each of Beijing, Hong Kong and Shanghai. Other Asian carriers (such as JAL and Korean Air) have more than a daily service from New York. With China Southern flying from the world's manufacturing hub (the Pearl River Delta), cargo is important. How much cargo could China Southern take on the A380? The A380 carries less cargo than the 777-300ER, which Cathay uses to North America. Cathay uplifts around 1.0-1.7 million pounds of freight a month from Hong Kong to New York JFK on its three daily non-stop flights, according to BTS data. Hong Kong-Los Angeles, which Cathay also serves with about three daily flights, saw closer to three million pounds of cargo uplifted a month. 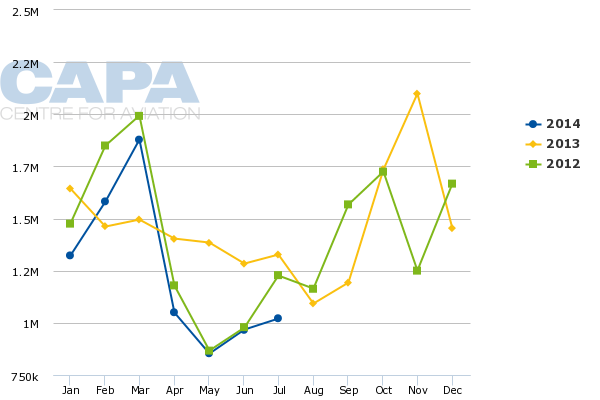 Cathay added a fourth daily flight in Jun-2014, and this is reflected in the graph below showing a spike in uplifted cargo that same month. While Los Angeles could show different demand for freight, the greater influence is the New York flight's longer distance, restricting payload. China Southern could be expected to face more restrictions, especially flying the longer westbound-sector, although cargo demand is lower in this direction. Perhaps surprisingly, China Southern – as it reports data to the BTS – carries about one million pounds of freight a month from Guangzhou to Los Angeles on its single daily passenger A380 flight, in line with Cathay (three million pounds across three daily flights). 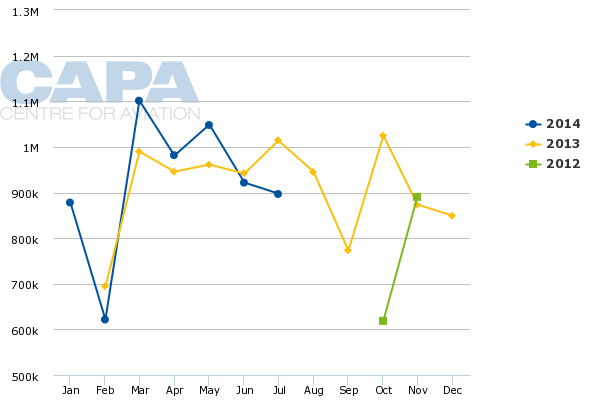 China Southern's Guangzhou-Los Angeles load factor is typically above 85%. China Southern's first long-haul route for the A380 was Los Angeles (replacing the 777-200ER that served the route for over a decade). This deployment came a considerable time after the A380 was delivered to China Southern and was used in the intervening period mostly on domestic (and Hong Kong) sectors. China Southern once said 55% of Los Angeles A380 passengers connect beyond China (such as to the Philippines). On the larger subject of route profitability, Mr Tan asked analysts not to consider route-by-route analysis as "we have to rely on the network". The carrier’s handful of A380s, the pride of the fleet, were restricted to domestic and Hong Kong routes with low utilisation rates, accumulating USD16 million losses in six months. So it was a substantial reversal when the carrier, at its results briefing, requested that analysts not “worry too much about China Southern’s international expansion”. Besides Paris, China Southern is understood to have also looked at Frankfurt (but from Beijing). China Southern now serves Frankfurt via Guangzhou/Changsha but is unlikely to deploy the A380 on the route. With New York and Los Angeles A380 services, China Southern could still support another A380 long-haul route. Although not necessarily with the A380, China Southern may look at other US destinations for further growth while China Southern subsidiary Xiamen Airlines is looking to launch North American services with its 787s. Xiamen has a base in Fuzhou, and Fuzhou-New York is the largest under-served trans-Pacific city pair, but yields and aircraft performance will be challenging. Further growth in the trans-Pacific market, and more long-haul services from China Southern, will challenge short-term sustainability. China Southern was always going to need more than four weekly flights to be a serious contender in New York.